This page tells you about the stages of prostate cancer. The stage (extent) of a cancer is one of the most important factors in choosing treatment options and predicting a man’s outlook. The stage of a cancer tells the doctor how far the cancer has spread. The tests and scans you have when diagnosing your cancer give some information about the stage. secondary cancer (metastases – M). Stage T3 and T4 tumours are referred to as locally advanced prostate cancer. Lymph nodes are described as being ‘positive’ if they contain cancer cells. If a lymph node has cancer cells inside it, it is usually bigger than normal. The more cancer cells it contains, the bigger it will be. As well as using the TNM staging, doctors put prostate cancers into 3 groups. Locally advanced prostate cancer- cancer that has broken through the outer covering (capsule) of the prostate gland. Metastatic prostate cancer- cancer that has spread to other parts of the body. 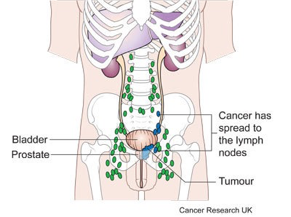 Prostate cancer most commonly spreads to lymph nodes in other parts of the body or bones. It can spread to other organs though. 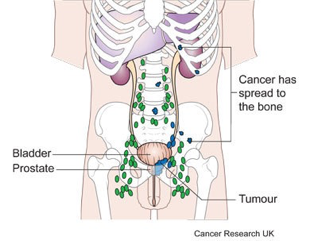 It is sometimes possible to have metastases (cancer spread) present even when the prostate tumour is still very small. So even if the tumour appears to be very small, when a bone scan shows that there is cancer in the bones, the prostate cancer is M1 stage. It will be treated as metastatic cancer and can often be controlled for several years with treatment.